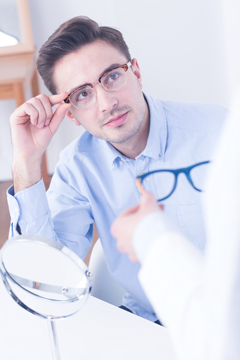 When you are first fitted with your progressive lenses, you may require a brief adaptation period to become comfortable when using your lenses. This could take just a few minutes, or it might take a day or two. Little peripheral aberrations, usually are not preventable in progressive lenses. Moreover, it is impossible to make a line-free (seamless) multifocal lens which has many powers for various viewing distances without making unwanted deviations somewhere around the lens. Lens manufacturers and designers have made significant strides in reducing these deviations and changing them into the periphery of new progressive lenses. But these peripheral aberrations will still be present even if progressive lenses are produced without flaws using new manufacturing tools and equipment they will still be specific optical set back to all progressive lenses. Due to these aberrations, when you look to the far left or right, mostly when looking downwards, you may notice the vision is a little bit blurred. Peripheral aberrations might also cause you to observe a sensation of “swim” whenever you make fast head movements. If you notice these issues when you begin using a new pair of our progressive lenses, you often can eradicate them by making slow head movements to glance more uniquely at objects. Many people that experience these peripheral vision issues when using progressive lenses discover that these problems are relatively soft and slowly disappear when they fully adapt to their progressive lenses over a short period. In case you have hyperopia, then getting used to progressive lenses might take a little longer than someone who is only mildly nearsighted or is farsighted. But with recent lens designs, almost everybody can successfully wear progressive lenses. Having difficulty in adapting to progressive lenses, book your consultation with one of our optometrists today, at our 360 Eyecare location in the Beaches, Toronto.